Do you always have unexpected guests dropping in at almost anytime for a stay overnight? Are you used to getting house calls from family and friends? Is your grandkids coming in for a long sleepover? For all these situations you need to prepare hastily for sleeping accommodations on duvets and couches, right? With the all new and highly affordable Intex Pillow Rest Raised Airbed with Built-in Pillow and Electric Pump, you would not be moving around in the look out of a comfortable and quick fix sleeping solution. The Intex air mattress offers much more than just an adequate sleeping solution. This air mattress is comfortable, fast and most importantly, it will not fail to mesmerize you. It is also best for camping trips right around the corner when you do not have ample time to look for movable sleeping accommodations. It is the perfect solution to getting hold of places for everyone to be able to sleep comfortably. 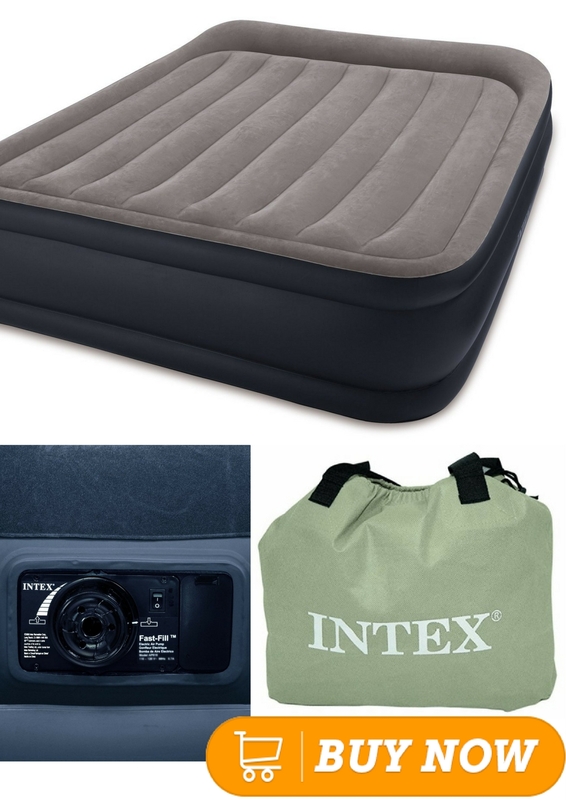 The classic pillow rest raised air mattress from Intex possesses a wide assortment of features guaranteeing thorough convenience and total comfort. One of the most notable comfort features of this airbed is its in-built air pump which works on electricity making way for quick inflation. I personally admit that you will not have to wait for a very long time for the bed to get inflated. It gets inflated in not more than 3 minutes serving as a convenient sleeping option. There could be no better alternative than the Intex Pillow Rest Raised Airbed for people who want to sink deep after a long day’s work. There is no feeling better than knowing that you have a bed ready at home for your comfort and that too within a very short notice. Comfort factors offered by this air mattress from Intex do not end here. The air mattress also features in-built pillows specifically designed for providing the head with raised support. This offers great comfort when lying down. Neck muscles do not strain, thanks to this nifty and perfect feature. This air mattress comes with a height of around 12 inches above the ground. Therefore, it ensures that the users get good insulation from cold and proper protection from the creepy crawlies. Another cool feature of the Intex Pillow Rest Raised Airbed is its durability. The flocked top of this mattress is made using good quality and strong vinyl beams. Thus, this air mattress offers both durability and comfort to its users. Several users have praised this product for its durability. It has the capacity of lasting for a very long time without the slightest hitch in the level of comfort offered. In addition to durability, the mattress top is 100% water resistant up to 21 gauges while the sides of the mattress are waterproofed up to 15 gauges. With this exclusive feature, users do not need to worry about spills that can damage the surface of the mattress. Rendering major advantages like mid-rise height and lighter weight, the Intex Pillow Rest Raised Airbed is perfect for all those individuals who want the convenience of a blow-up mattress and the comfort of a bed. This product comes with 20.8-gauge quality-tested top that offers a secure and comfortable sleeping surface to users. This air mattress can be inflated very easily no matter you are at your in-laws’s house or on the guest bed in the basement. With this air mattress, you no longer need to worry about tiring your hands for the purpose of inflation. The comfort level of the mattress can easily be customized with a single touch of a button. Available in different sizes suiting the requirements and budget constraints of different people. Possesses the ability of holding air for a very long time without refilling requirement. Can be stored very easily and takes up very little space. It is highly portable and can even be carried very easily. Possesses the capacity of holding up to 300 pounds. Firmness generally varies with temperature, humidity and location. The customer service available with this product is simply great. However, it is to be noted that it does not come with a guarantee. Problems faced if any, with inflation and deflation procedure of the Intex Pillow Rest Raised Airbed can easily be sorted out by taking them to customer support available 24/7. The product is highly appreciable because of the convenient and comfortable features that it is equipped with. The guarantee for the product is not a major problem as it hardly gets damaged even after regular use. 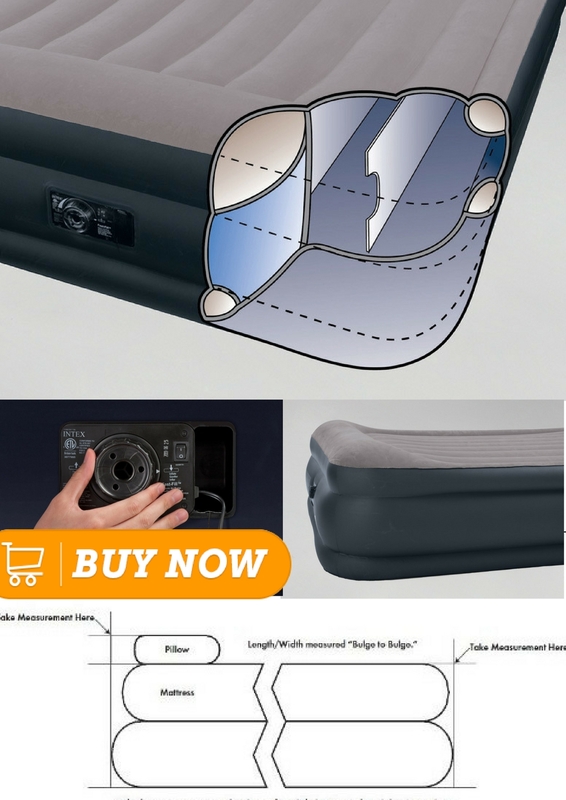 Final Say on Intex Pillow Rest Raised Airbed with Built-in Pillow and Electric Pump, Twin, Bed Height 16.5"
Thus, it can rightly be concluded that the Intex Pillow Rest Raised Airbed is an air mattress that offers maximum comfort and a rest easy opportunity to its users. The dearth of drawbacks and the abundance of benefits make this classic air mattress a faithful sleeping companion. It is a long-lasting, highly comfortable and well-renowned air mattress from a popular brand sure to serve you and your family in the best way possible. The mattress offers convenient, quick and comfortable options for a good night’s sleep for sleepers willing to sleep almost anywhere. It's a mattress that meets all safety and quality standards.